Storytelling is more than just a childhood pastime. It is also one of the key components of conveying your brand’s message, image, feel, and overall experience. It plays an especially important role in today’s congested business environment. 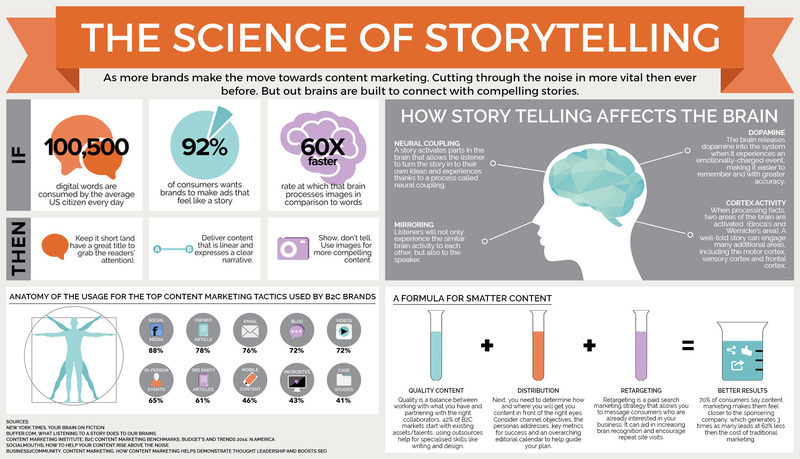 But what does brand storytelling look like? I would like to deliver healthy and classic food to tables across the world for those who don’t have time to cook. As I sit in my yellow-colored, sun-lit kitchen, I remember a time when I was little, and my mom used to make me breakfast. I would watch as her hands moved like two ballerinas dancing to the rhythm of pots and pans clinking and clanking together. Suddenly, I had a craving for a big bowl of heart-warming oatmeal. I used my mom’s secret tactic: toasting the oats before heating them in the milk. However, instead of plopping a spoonful of Kraft peanut butter on top, I opted for my homemade almond butter, maca powder, and acai berries. After polishing off every last bite, I experience the same satisfied and warm feeling I had when my mom made me her oatmeal. I then realized that it was my mission and dream to bring this same feeling to kitchens across the world. That’s when I started “Evelyn’s Eats,” a food service dedicated to delivering classic, mom-approved dishes with a modern millennial-approved twist to those too busy to fit in a home cooked meal. Both texts get Evelyn’s mission across – she wants to deliver homemade food to people who are too busy to prepare food for themselves. But which version is more engaging? Which version creates a feeling, an experience? No doubt it’s the second one. In today’s congested digital environment, it’s more important than ever to use the impact of brand storytelling to captivate the consumer. What’s at stake for companies that don’t attempt brand storytelling? Consumers are in control in today’s digital marketplace. They have the power to research, browse reviews, view product videos, and easily compare everything between brands. So, besides price and quality, what drives a consumer to choose one brand over another? Brands that get their story across are going to be the ones getting the consumer’s attention. In other words, the growth of your business is what’s at stake. A story helps create an experience that differentiates one brand from the other. The story you create around your brand will resonate with like-minded consumers that are looking for a similar experience. For example, imagine two kitchen supply retailers that both sell blenders. One brand creates a commercial that features a salesperson yelling about low prices. The other features a woman, waking up at 6:00 AM before her run. She’s tired and really doesn’t want to get up. Then, a smile spreads across her face as she remembers that she has a new blender that makes the most epic, energy-packed smoothies. After a short montage of different foods being thrown into the blender, she peacefully drinks her smoothie and takes off with bright eyes for her run. The second brand shows the consumer the experience the blender could create for them. For a real-life example of excellent brand storytelling, check out this video by the outdoor apparel company Patagonia. Why would a consumer choose Patagonia over, say, North Face? Their video not only dives into the background of how Patagonia was imagined, but also how the brand is relevant for today’s consumer. Patagonia is differentiating themselves as a leader in relevant and authentic political change and creating an experience for consumers looking to help preserve nature. As you can see from the illustration, storytelling is also neurologically designed to spark thoughts, ideas, and emotions in the listener. We’re here to tell you that in reality, your story is already in existence because you’re selling today. Your website is already telling people what you do and why you do it. Your “blog posts” “home page”, “how it works”, and “customer testimonial” pages are all a part of your brand’s unique story. Continuing from the example above, imagine you’re in search of a new blender. You walk into a kitchen supply store, and a salesperson approaches you. He makes an effort to make you feel comfortable, to ask what your needs are, and to point you in the right direction. You leave the store with a brand new blender, a feeling of genuine connection – and will fondly remember the brand for it. Now, imagine yourself shopping for the same blender, but this time, you’re behind your computer. Why should the digital experience feel different from the retail experience? The answer is: it shouldn’t. But there’s something about the digital world that puts the customer at arm’s length. As digital sellers focus on stats and data, the online experience begins to feel distant and cold, and the intention for connection gets lost. But in reality, brands should be striving to create the same experience that is encountered in a retail store. One way to create this experience in the digital space is by using the promotional vehicle of native advertising to share your story through content that already exists. The main idea here is to seamlessly integrate your existing story with the right publisher in order to capture the right audience. As we mentioned earlier, consumers have the control to compare and contrast multiple brands. For example, if you’re shopping for a blender online, you are most likely going to take the time to compare and contrast brands. Now, let’s say you take a break from shopping for blenders to browse the news on Yahoo. Within Yahoo, the kitchen supply retailer can integrate a seamless article that promotes a more holistic view of the kitchen supply brand. Now you may feel connected to this particular article as it shares recipes and ideas for using the blender. This article can make the difference further down the sales funnel because it encouraged you to feel the experience one kitchen supply retailer can create over the other. This is how native advertising can help you tell your brand’s story and create an experience for your target audience. » News » The Importance of Storytelling in Today’s Congested Digital Environment.